Anyone can take a hand or bath towel and gently place it over a towel rack. However, it is possible to make towels part of the decor of the bathroom without a lot of skill. Using beautiful colors and interesting ideas, it is possible to transform the common towel into something special. Before looking for the easy way out, here are three tips for displaying bathroom towels. Towels don’t have to hang somewhere. Instead, consider rolling them up and placing them inside a basket. Bath towels, hand towels and even washcloths can be placed together, offering up different sizes and different heights to add to the overall look. By using different colors and sizes of towels, the display gets an added touch of variety. As an added bonus, having towels prominently displayed in a basket makes it easy for guests to get a washcloth or towels should they need one while in the bathroom. According to Better Homes and Gardens, baskets, bins, bowls and plant pots can be used provided that they match up with the bathroom’s current decor. Who says there is only one way to fold a towel? There are multiple ways to fold any type of towel. Most of the time, people choose to find the most efficient method of folding that makes it easy to keep multiple towels in one place. But when the time comes to use the towels like decorations, it makes sense to try out different ideas. For example, if a towel isn’t going to be used regularly, consider folding it around another object to provide more depth and space. It breaks up the monotony of the area and can provide a more interesting display. For those with a little extra ambition, consider using some origami techniques with towels to make something totally different. Towel racks are great. They offer a convenient place to store towels and keep the easily accessible for someone just getting out of the shower or looking to dry off their hands. However traditional racks aren’t the only way to hang up towels. Everything from robe hooks to a coat rack can be used to make towels part of the bathroom’s overall presentation. Even a coat rack can be set up on a bathroom wall to make it easy to keep a towel within reach. For bathrooms that are clearly understated, it may be okay to just use plain, white towels in multiple ways. 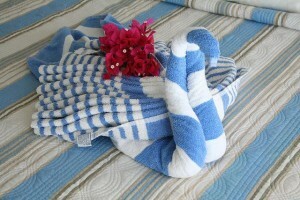 However, for those looking to add a pop of color, consider checking out http://www.dunelm mill.com/shop/towels/. There are tons of different colors and patterns to choose from and hanging them up can bring out some real colors and give the bathroom the finishing touches it needs. When it comes time to decorate, it isn’t the expensive items that complete the look of a room. In fact, there are times when just simple changes can completely transform the space. Bathroom towels can be used for more than drying off. With a little bit of creativity, they can be a great addition to any bathroom’s decor.